Fast-forward a few years and I admit that beyond the discovery that I do occasionally enjoy this type of novel, I fell back into my small world of picking up books within the same genres I always had by the same authors I always read. 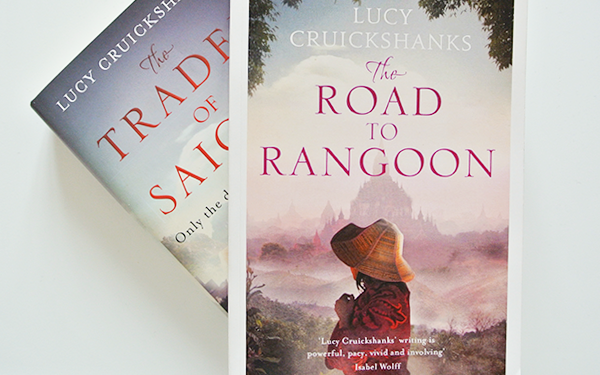 It took the release of Lucy's second novel to remind me that there is more out there and leave my comfort zone once more, this time to be transported to 1980s Burma. Lucy has written an impeccably researched novel to create a heart-wrenching and haunting story of different people's lives colliding in the worst possible way amid the terror and confusion of a Civil War. The rebels and the government are in an impossible stand-off where there can no longer be any winners as there is little beyond fear, corruption and ultimately death on both sides. One of the people caught in the horrific events playing out is Thuza Win, who was just a child when her parents were beaten in front of her eyes and taken away. The people who took her parents also slashed her tongue and now she is known as Naga-Ma, serpent, among the local people. She tries to not let the locals bother her and instead she focuses all her time and energy on smuggling rubies across the border to help her brother in the rebel camp and save up enough money to go to Rangoon and save her parents from prison. Than Chit is an officer in the Tatmadaw, the government military organisation fighting the rebels. His biggest dream is to be recognised by General Bo Win and he believes that getting his intelligent son, Min, to join him in the Tatmadaw as soon as possible will put him on the fast-track to the promotion he deserves. And finally there is Michael, the son of the British ambassador in Rangoon. He gets caught up in a bombing in the city and he makes a discovery that leads to his life colliding catastrophically with those of Thuza and Than. They meet under the most terrifying of circumstances and all three of them have their own agenda as they formulate a plan that will help them get what they want; Thuza's parents freed, Than's promotion and Michael's discovery made public. I don't do graphically depicted scenes of people being tortured and suffering well, and there were plenty of those in The Road to Rangoon. It made me feel uncomfortable at times while reading yet it also added to the authenticity of the story and I realise that without them this book wouldn't have made the impact on me that it did. The choices people were forced to make in 1980s Burma were horrific and a lot of the time there was no clear right or wrong, there was only doing what you had to do to survive. People such as Thuza and Than would've been the bad guys under any other circumstances, yet they often made the only possible choice in difficult situations, hoping that the end would justify the means. Of course it wouldn't, but their sheer determination got them through the worst of times and that was admirable. I didn't particularly like any of the characters to begin with, except maybe for Michael, yet despite the terrible things they did, Lucy Cruickshanks has done an impressive job of making me understand why the characters had to make these difficult choices, up until the point where I actually started to feel sympathetic towards them. And she has an incredible way of transporting the reader to a faraway setting that is so alien through our blessed Western view of the world that it almost feels like pure fiction. But of course what makes this novel so disconcerting is that the story is rooted in facts, and that events very similar to what the main characters suffer from have truly happened to a lot of the Burmese people; whether they were on the government's side, the rebel's side or neither, nobody would've come out unscathed. It's insane to realise that all this went on quite recently, and similar practices still are elsewhere in the world. It's very easy to close our eyes to the horrors that are happening beyond our own borders, but books like these are much-needed eye openers. The Road to Rangoon isn't an easy journey, not for the characters and not for the readers either, instead it is horrific, haunting and heart-wrenching. However, if you can persevere through the disturbing imagery showing the worst side of humanity, you'll be rewarded with an intelligent and incredibly impactful read. This isn't an enjoyable novel in the literal sense of the world, but it is an engrossing and enlightening one, and the powerful story within packs such a punch that it will stay with the reader long after turning the final page.